All veterans are entitled to burial in a national cemetery, a grave marker (regardless of the cemetery), and a flag. Spouses and dependent children are also entitled to a lot and marker, but only in a national cemetery. There will be no charges for opening or closing the grave, a vault or liner, or setting the marker in a national cemetery. Depending on the circumstances, a family will be responsible for all other expenses, including transportation to the cemetery. To reach the regional VA office in your area, call 1-800-827-1000. Death during active duty. 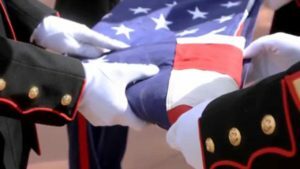 All funeral expenses will be paid by the military, including body preparation, casket, transportation to the place of disposition, interment (if in a national cemetery), and marker. In addition, next of kin are entitled to a death gratuity of $100,000. Death due to a service-related injury. There is a $2,000 burial allowance for these veterans, which may be used to cover some of the funeral director’s expenses, the casket, and transportation to the cemetery. If death occurred in a VA facility, transport of the body to the cemetery will be paid, provided it is no farther than the last place of residence. If burial is not in a national cemetery, there is a $300 interment allowance, but it is unlikely that will cover opening and closing or vault charges, let alone the cost of the lot. Although a marker is available at no charge, the private cemetery will probably have a setting fee. Non-service related death in a VA facility or while collecting a VA pension or disability compensation. There is a $300 burial allowance that may be used to defray some of the usual funeral expenses. Although burial in a national cemetery is free to these veterans, all other mortuary expenses are the responsibility of the family. Transportation to a national cemetery (not farther than the residence of the deceased) will be provided only if the death occurs in a VA facility. The $300 interment allowance applies when burial is in other than a national cemetery. Death of a veteran outside a VA facility, not receiving military pension or compensation. The $2,000 and $300 benefits do not apply, nor is there reimbursement for transportation to the cemetery. The lot in a national cemetery, any required vault, interment, a marker, and flag are the only burial benefits. If interment is in other than a national cemetery, the family is responsible for the cost of the lot, opening and closing charges, the vault, and any fee charged for setting the government marker if that is selected. The family must also bear all other funeral costs. A spouse and dependents of an eligible veteran are entitled to burial in a national cemetery even if the veteran is not buried there. A spouse who remarries a nonveteran may claim burial rights from the prior marriage. Spouses receiving military pay and who die in a military medical facility are eligible for military transport to the nearest national cemetery or no farther than the last permanent residence. Adult children of veterans are entitled to burial benefits only if disabled and dependent. There are a number of others eligible for veteran burial benefits if the person has provided military-related service. The list is quite long and includes civilians who were involved with military efforts during wartime. Members of the National Guard and Reserves with 20 years of service are eligible. Some public health service personnel are also eligible. You should inquire if you believe you might be entitled to such benefits. Memorials are available to all veterans, spouses, and dependent children buried in a national cemetery and will be set without charge. For veterans who died before Sept. 11, 2001, markers are available to them—not to the spouse or dependents—for use in other cemeteries unless the grave has already been marked by a private memorial. For veterans who died on or after Sept. 11, 2001, the government will provide a headstone even if the grave already has a private marker. The installation cost must be borne by the family when in a non-government cemetery. Several styles of markers are available and must be consistent with existing monuments. Niche markers for cremated remains are also available. Inscription must include name, branch of service, year of birth, year of death (in this order) and may include emblem of belief, rank, and decorations earned. At private expense, additional items such as nicknames and terms of endearment may be added but must be approved by the VA. The VA has gotten complaints from veterans who were approached by commercial funeral outfits offering free cemetery lots or other so-called veteran benefits. They do not represent the U.S. government! Where is it located? How much will it cost? Do marker or planting restrictions exist? Who owns the cemetery? Are there nearby municipal or religious cemeteries which charge less for the same services? Burial at sea or the scattering of cremated remains at sea is available to all veterans and dependents, and is provided by the Navy or U.S. Coast Guard. A flag is required, and—if supplied by the family—can be returned. If supplied by the Navy, it will not be. Because sea burials are done at the convenience of the military, the family may not witness sea burial. Bodies waiting for sea burial must be embalmed to a state of preservation that will last for at least 60 days. This is accomplished with undiluted embalming fluid. A non-sealing metal casket must be used, bound with six bands of nylon. The casket must carry 150 lbs. of extra weight. Two-inch holes (20 total) must be drilled in the top, bottom, and at each end. You may not reserve space in a national cemetery ahead of time; arrangements are made only at the time of death. Therefore, there is no guarantee that spouses will be interred side by side. Military honors or a funeral honor guard may be available from nearby military installations or veteran groups. Flyovers are reserved for those on active duty at the time of death. A flag is provided on request for the burial of any veteran. Apply through the VA and pick up at a U.S. Post Office. Family members may wish to purchase a flag case for later display, available through private sources. Next of kin other relatives or friends may request a “Presidential Memorial Certificate.” More than one may be requested. A family may apply directly to the VA for all benefits. Although it may be convenient to let the undertaker do so, you may wish to ask if the mortician charges for submitting claims. When the body of a veteran without next of kin is unclaimed from a VA facility and the estate is without sufficient assets, the VA will assume responsibility for burial. Other than for sea burial, there are no casket requirements for routine body burial. An undertaker handling the unclaimed body of a veteran must supply something more durable than cardboard, unless the body is to be cremated. “No-fee” passports are available for family visiting overseas grave sites or memorials. The National Cemetery System may be asked to do a search to locate anyone interred in a national cemetery. In addition to general vital statistics, you will need to know the state from which the veteran entered military service. There are state-run veteran cemeteries that may offer the same or similar benefits, with some restrictions.